Failure To Pay Payroll Taxes? There are many reasons businesses may fail to pay payroll taxes and end up facing the Trust Fund Recovery Penalty. For many businesses, when going through rough financial times, the IRS, Franchise Tax Board and Employment Development Department are the last people to get a call or get paid. Generally, most businesses will opt to pay other creditors first, such as their suppliers, lenders and overhead. So, the amount of money that was withheld from their employees paycheck for payroll taxes may have gone toward paying their general business expenses. Businesses are required to withhold federal income taxes, and the employee's portion of social security, and Medicare taxes, and remit those, along with the employer's share of payroll taxes to the IRS. Failure to do so incurs huge penalties, and individual liability for the person responsible for not remitting the taxes. The penalties for failing to timely file and failing to fully pay the payroll taxes results in enormous penalties to the employer. The penalties and interest are so egregious that they will double to triple the payroll taxes in three to seven years. 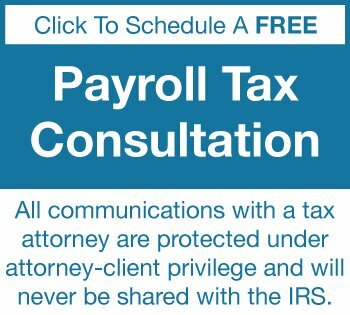 If you start falling behind in your payroll taxes to the IRS, please contact this tax law firm as soon as possible, so we can get you back on track, and hold the IRS revenue officer at bay. The IRS will quickly come collecting unpaid payroll tax deposits, and they will lien, levy, and seize your business all in an effort to prevent pyramiding future payroll taxes. This tax law firm will help you in this difficult period of time. We are one of the few firms that have both an accounting and bookkeeping division, and also a legal and tax division to help you with the payroll taxes, and the problem issues. Even though the payroll tax debt is a liability of the business, the IRS can hold the responsible party who willfully failed to pay the payroll taxes individually and personally responsible for the trust fund portion of those taxes. This not only includes the business owner, but also includes the president, officers, directors, shareholders, managers, CFO, accounting, and bookkeeping employees if they made the decision as to which creditors got paid. This tax law firm will proactively obtain all the corporate formation documents, accounting and financial records, and minutes to show that you are not the responsible party who willfully failed to pay the payroll taxes, and therefore are not individually liable for the business's payroll tax debt. This tax law firm will defend your rights against the IRS when they try to collect these funds from you. We have an excellent reputation in the community for aggressively representing our clients before the tax agencies, and obtaining an excellent result for our clients. 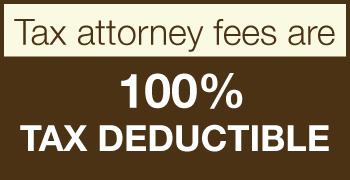 Please give us a call at 858-481-4844 to discuss your tax case. The call is protected by the attorney-client privilege, and will never be disclosed to the IRS. We look forward to hearing from you. The problem with failing to pay payroll taxes is that some of the steepest penalties and interest in the internal revenue code come from failure to file or failure to pay payroll taxes. So, if you are not timely with filing and paying your payroll taxes the penalties are very steep. For instance, a business owner may feel that a $50,000 liability is something that they can handle in another 30 days, that is going to turn into $60,000-$70,000 in a matter of days. And, with that type of compounding from penalties and interest for failure to pay payroll taxes it can become insurmountable in no time. So, where an employer may think that it will be OK if they just don't pay for a little while, but intend to make up for it as soon as they can, the penalties are severe. Payroll taxes carry some of the steepest penalties in the tax code. So if you have a business that is grossing $500,000 per year, they can quickly rack up penalties and interest of $200,000 and have absolutely no way to pay that off. Fortunately, there are things that we can do to go in and take a look at the circumstances, build a case around lack of willful neglect and get some of the penalties and interest removed. There are things that can be done, however it is important to take action quickly. In the event that a corporation fails to pay the IRS the money that was withheld from their employees paychecks, then the IRS can and will pursue a responsible person for that corporation for the "Trust Fund Recovery Penalty". A responsible person would be an officer, director or shareholder, someone that is a go-to person within the company. Each person within the company who qualifies as a responsible party, someone who had the ability to make a decision on making the payment for payroll taxes to the IRS, each responsible person can and will be held individually liable for the trust fund recovery penalty, regardless of the corporate shell. 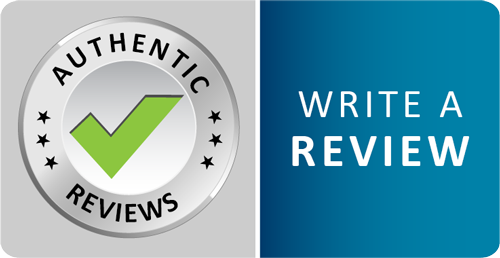 What Is Trust Fund Recovery Penalty Abatement? Trust fund recovery penalty abatement is showing either that the individual that is being assessed the trust fund recovery penalty is not a responsible party, or did not willfully fail to pay the payroll taxes. Then, they can get out of the trust fund recovery penalty and they won't be assessed that huge amount of money. There are penalties for failure to pay, there are also penalties for failure to file your tax returns. Those are the two biggest ones and penalties apply at both the federal and state level. The equation for how the penalties and interest is very complex and applies on a case-by-case basis, however these can be incredibly huge sums. The penalties and interest are virtually the same from the state employment development department and the IRS. The only difference is that the IRS bases the trust fund recovery penalty on the amount that was withheld from the employee, but the employment development department in California took that a step further and those penalties include not only the amounts that you withheld from your employees and didn't remit to the IRS, but also penalties and interest on top of that. So, it's virtually the entire amount. Therefore, it is worse at the EDD level than it is at the IRS. If you can show reasonable cause and lack of willful neglect, there are certain penalties that you can get out of. Typically you have to develop a tear jerking argument to show the reason that you didn't pay or didn't file on time had to do with reasons beyond your control. The reasons that tend to work best are those that are personal in nature, not business reasons. If you just chose to pay a different debt, that doesn't work. But, what does tend to work are things that are very personal in nature having to do with your family or your employees welfare, medical problems, that type of thing. 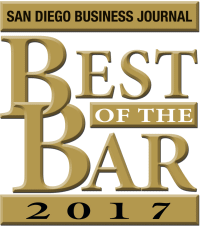 However, with that said, this tax law firm has built many successful cases over the years to fight penalties and interest stemming from failure to pay payroll taxes and from the trust fund recovery penalty. The best place to start is with a free consultation with the full benefit of attorney-client privilege so that we can take a look at the facts of your case and weigh your options.